Why exactly do bananas acquire or lose their color or glow? Is the presence or the absence of a given molecule the cause of these shifting colors? Which subcellular compartments and molecules are the cause of bananas appearing green, yellow, red, blue or black under different lights? The answer, my friend, is glowing in the wind. 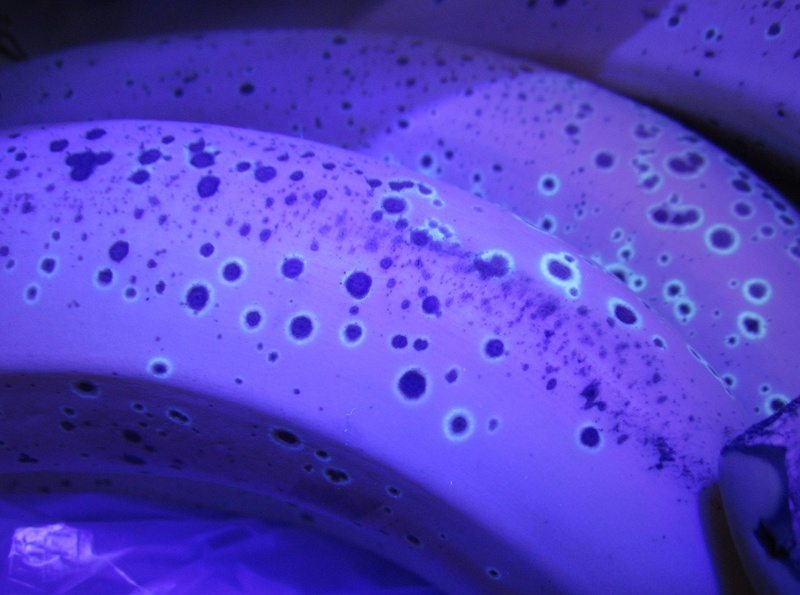 The fact that banana fruits glow blue under UV light is an interesting topic that needs scientific clarification. Ten years ago, some articles from Professors Bernhard Kräutler, Thomas Müller, Clemens Vergeiner and Simone Moser in Austria introduced this interesting topic about chlorophyll degradation and plant fluorescence. We raised questions and pointed to perceived problems of interpretation with published reports in high ranking journals, such as PNAS and Angew Chem. 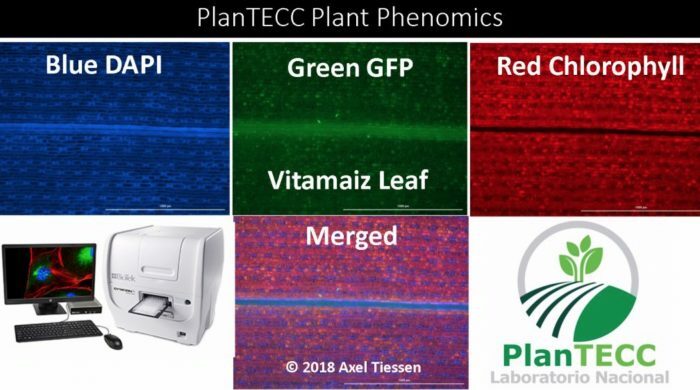 The work was performed at the Mexican research institute, Cinvestav Irapuato, at the National Laboratory PlanTECC, which focuses on plant phenomics (global characterization of the phenotype of plants). Using cutting-edge instruments, e.g. Cytation 5 from Biotek, we provide technical services of detailed microscopic analyses depicting the subcellular distribution of plant metabolites in several crop species such as maize, potato, tomato, and banana. The ripening stages of bananas can be distinguished based on color and the development of brown spots. Green chlorophylls visually disappear in ripening banana fruits as the peels acquire a yellow color. It had been previously postulated that the blue glow was mainly caused by fluorescent chlorophyll catabolites (FCCs). Those interpretations about FCCs were presented in several newspapers between 2008 and 2011 and were consequently accepted by the public. A school teacher in 2011 performed experiments at home inspired by the title: apples are red and bananas are blue. Blue glowing bananas became a popular topic in school science fairs around the globe through several internet sites such as the following: livescience, ediblesciencefaire, nationalgeographic, phys.org, arstechnica, prospect, newscientist, and telegraph.co.uk. Teachers may impress pupils with a color conundrum, but as scientists we feel compelled to inspect the inner compartments of plant cells under the fluorescent microscope at high resolution. Autofluorescence allows the visualization of metabolites in plants and cells. 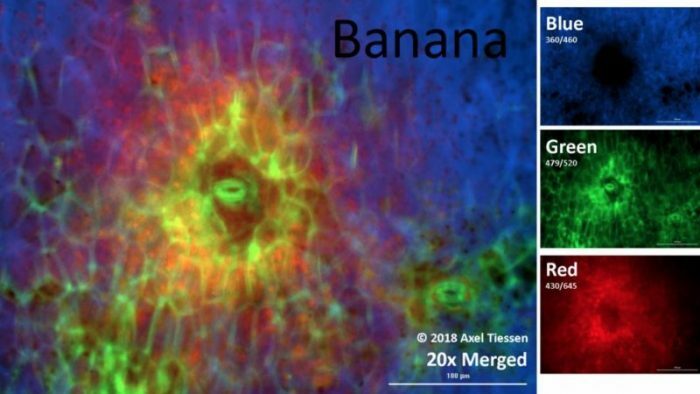 The fluorescence imaging technique can not only be applied to banana fruits but also to many areas of botanical research such as leaf phenomics. 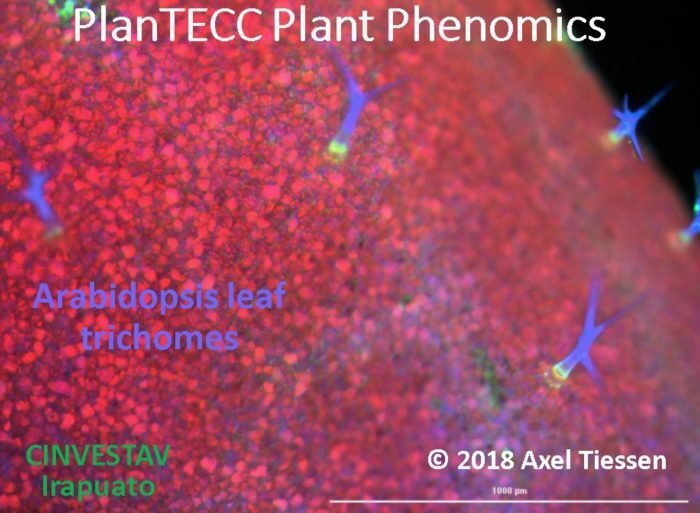 For example, Arabidopsis trichomes do not contain chlorophyll catabolites (FCCs), but they glow strongly blue due to several alcaloids and phenolic compounds as seen in the picture below. We like to understand the subcellular distribution of metabolites since plant biosynthetic pathways and their regulation depends strongly on the subcellular compartmentation of enzymes and metabolites (Farre et al., 2001; Tiessen et al., 2002). Moreover, signaling is influenced by subcellular location, flux and membrane transporters (Tiessen et al., 2012; Tiessen and Padilla-Chacon, 2013). For example, the concentrations of sucrose, 3PGA, Pi and trehalose-6-P inside the cytosol or plastid regulates starch synthesis in potato tubers (Kolbe et al., 2005). In maize and barley grains, the subcellular transport of ADP-glucose from the cytosol to the plastid determines starch content (Tiessen et al., 2012). 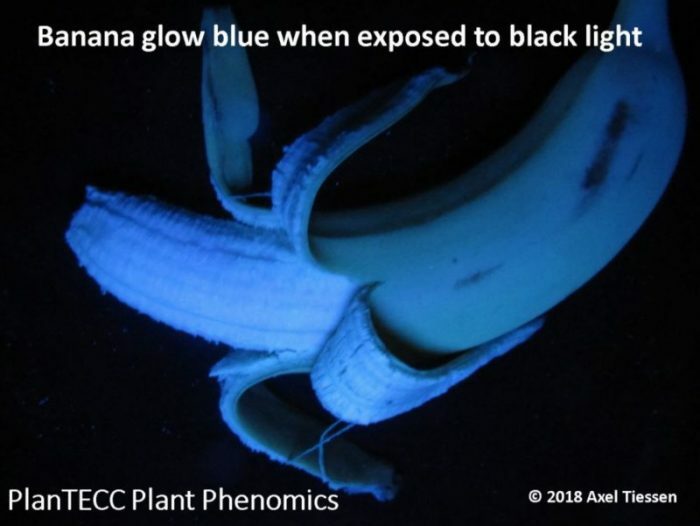 If FCCs are the main cause of a banana´s blue glow, then the subcellular origin of the blue fluorescence should coincide with the subcellular accumulation of the soluble FCC molecules. Science advances when we look with more detail or when curious pupils pose apparently trivial questions. A teacher felt frustrated with the first experiment by the lack of a visible difference between ripe and unripe bananas and had to search for fruits that were much greener than those available in the supermarket (Tepolt, 2011). When trying to replicate the experiments of Moser et al (2009), we couldn’t see the blue fluorescence inside the cytosol, the vacuole or the plastid. We wondered why? We only detected blue fluorescence in the cell wall. One observation leads to another question and so forth. Did chlorophyll degradation and FCCs production not occur inside the cell? Did stomata first degrade its own chlorophyll followed by fluorescent FCCs accumulating in the surrounding cells that glow blue? Why did Moser et al detect stomata in the middle of the necrotic spots? Apparently simple questions involving bananas became more challenging once they surpassed the established scientific knowledge. Was the strong blue fluorescence of bananas really due to the transient appearance of FCCs only at the yellow stage? When performing experiments with Mexican bananas, I noticed that not only yellow bananas glowed blue, but green and brown bananas as well. All bananas glow blue, more or less but they glow. Unripe bananas fluoresce in red (~685 nm) when exposed to blue light (~450 nm), whereas ripe bananas fluoresce in blue when exposed to UV light (~370 nm). I confirmed that a large increase in blue fluorescence emission can indeed be observed during the maturation process of banana fruits. Plant samples at different stages of development were compared. Indeed, chlorophyll red fluorescence correlated negatively with blue fluorescence. This was most markedly evident around stomatal cells: black holes of blue fluorescence were caused by the presence of red chlorophyll as in the picture below. I also inspected the leaves of greenhouse-grown banana plants, and I obtained similar pictures as shown below. Banana tissue that is yellow shows a stronger blue fluorescence than green tissue. Again, my results were in line with previously published pictures as in (Vergeiner et al., 2013). The intensity of the blue fluorescence was negatively correlated with chlorophyll content, but as we learn at high school, correlation is not always proof of direct causality. The inner pulp of banana glowed also blue, but it did never contain green chlorophyll nor any catabolites such as FCCs. The blue fluorescence of the banana pulp might attract bats and other animals that search for edible food in the rainforest. In addition to bananas, my nails glowed also strongly blue as seen in the picture below, but fingernails are not the best source of mammalian nutrition, are they? Why do the fluorescent blue halos appear only in some bananas? Contrary to the report of Moser et al (2009), I was unable to detect the blue halos around the brown spots of senescent banana fruits. This observation suggests that blue halos are not an intrinsic feature of banana ripening and chlorophyll degradation. Blue fluorescence in banana is not mainly caused by FCCs. Maybe halos appear only transiently at given timepoints due to an increase of NADPH levels and redox metabolism (hypersensitive response). 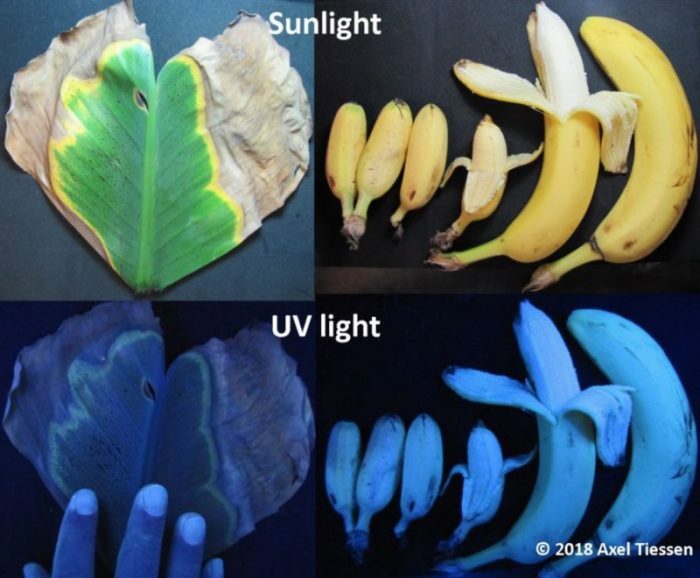 These findings are described in the article entitled “The fluorescent blue glow of banana fruits is not due to symplasmic plastidial catabolism but arises from insoluble phenols estherified to the cell wall” published in 2018 in the journal Plant Science (Vol 275 p75-83). The work was performed by Dr. Axel Tiessen from Cinvestav Irapuato, at the National Laboratory PlanTECC, which focuses on plant phenomics. Regulation of the primary metabolic networks of plants: we investigate how to control the balance between the production and consumption of carbohydrates in different plant tissues, and how the plant adapts its metabolism to the conditions of the environment during its development. We study the mechanisms, enzymatic reactions, subcellular compartmentalization, and the distribution of sucrose in different plant tissues and sink and source organs.